The Adams Alpha Series 5 Octave Rosewood Marimba features Adams latest tuning advancements and the Alpha series design options, which are sure to make your marimba stand out on the stage and in the studio. 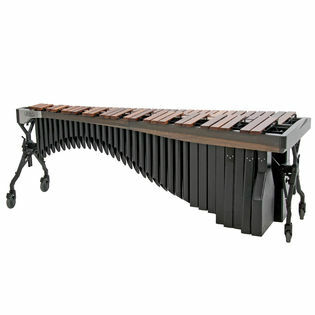 The Adams Alpha Series Marimba is available in 9 different color combinations. The rails are available in Graphite, Walnut, or Whitewash and feature the Alpha rail contour and Adams polished aluminum name plate. The resonators are available in Black, Desert, or Satin Gold and feature the Alpha high sweeping arc design. The height adjustable Voyager frame has been updated with a high arching cross support that disappears behind the sweeping arc of the Alpha resonators to provide a stunning look while providing the perfect soundstage for your audience. Adams Alpha Series keyboards feature tuning advancements that further enhance the sound of the instruments, notably making the upper registers sound more open and resonant. Using a proprietary computer assisted method, Adams is the only company producing bars meticulously precision tuned though an incredible sixth overtone in the lower register. This exclusive tuning process gives Adams keyboards the most stable pitch and evenness of sound available, and allows Adams complete control over all aspects of the marimba's sound.